A HUGE bunch of thanks to Rosy for the very kind donation of a Gum Tree!! She had this beautiful specimen growing on her 7th floor balcony and had looked after it for almost 10 years, but felt that it needed a home closer to ground level - and chose Leabank Square to plant it for her! Rosy - many thanks for this stunning tree - we promise to nurture & look after it for decades to come. Please feel free to come & visit it any time you like - and also - look out for a summer barbie invite to you (& everyone else who has donated to Leabank Square) in a couple of months time. Cut a hole in the side large enough to allow a free flow of seeds, but in such a way that it won’t all fall out on the ground in the slightest puff of wind, and won’t get wet if it rains. Make a few small holes in the bottom of your feeder to allow any rainwater to drain away. Hang it with wire, or even strong string from a tree or your washing line. If your feeder starts to wear out or the food in it goes mouldy, recycle it and make another one! Remember to keep your feeders well stocked, especially in winter. Birds come to rely on them and will go hungry if you forget. Stuff you need: Plastic drinks bottles, yoghurt pots or milk cartons (make sure they're clean), wire or string, bird seed, scissors. The designs come from the Royal Society for the Protection of Birds - and are so simple - almost anyone can make them. But if your parents don't let you use scissors - then please ask them for some help. How about making some of these amazing recycled bird feeders for Leabank Square? If you've saved up some pocket money - ask your folks to take you to the Poundland shop in either Stratford shopping centre - or Mare Street (number 30bus) - and get a huge bag of seeds for £1!! Come on Leabank Square - let's protect some birds! Look at this amazing visitor to Leabank Square yesterday? I know we have many other water birds (which will be added to this site in due course) - but we hardly ever see this utterly beautiful duck on our riverbank! Do yourself a favour - and grab a cuppa - sit on the riverbank for an hour - and feel the worries of the world just drift away downstream. Especially when you see this stunning beauty! Arena Fields - Where's my Legacy Dude?! As you can all see - the promised return of the playing fields opposite Leabank Square appears to be behind a row of terraced houses. I wonder how we are meant to interpret that? What does it all mean? 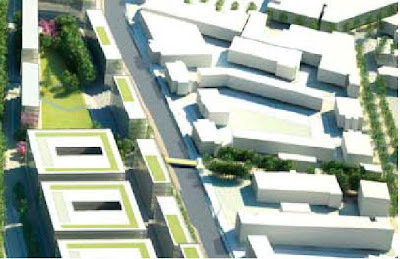 Is it that Hackney Council has given permission to turn over the planning consent for Arena Fields from 'an area of employment' to one where there are going to be residential areas? 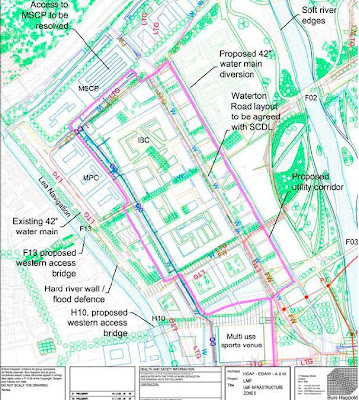 Does it mean that the kids from Gainsborough School are going to cross over their new replacement footbridge - and then through a residential estate - before getting to their replacement playing fields? Does it mean that we are no longer going to have a Chinese University opposite us? Does it mean that if Hackney Council fight the planning application - that we'll get a 5 storey storage warehouse - as a place of employment? 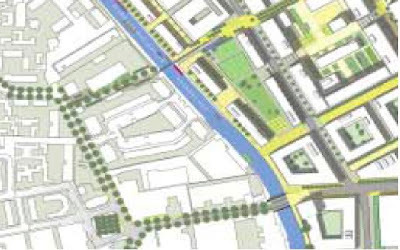 The most infuriating thing about the Legacy Masterplan - is that there is nothing concrete. It is still very vague and 'interpretish'. Due to an overwhelming demand - many residents want to discuss the management company - Property Maintenance & Management Services (PMMS) - who maintain Leabank Square. I know we did this back in September last year (http://leabanksquare.blogspot.com/2008/09/who-manages-leabank-square.html) and things got a bit heated - so let's see if we can have another go at discussing what we all want from our management company. We pay them quite a load of service charge each year - so let's please make sure we tell them just what we want in return. It is every heartening to see that 40 MP's signed the CONTROL OF DUST AND EMISSIONS FROM CONSTRUCTION AND DEMOLITION SITES put forward by Paddy Tipping - the MP for Nottinghamshire. Anyway - thanks to everyone who wrote off all those letters - what seems like many weeks ago now - 40 is a very good result!!! Those of you that follow the doings & don'tings of Parliament will know that to get this amount of signatures for a very local issue - is fantastic!! It's all the more sweet - as the ODA seem to be listening to us at the moment - but that doesn't mean that we should ever be complacent. There is still a very long way to go! But the most impressive thing is that we are attracting the right sort of attention - by going through the right channels. Don't be put off by our won MP completely ignoring us - who knows what kinds of lobbying she's getting in the House - we will just have to go it alone - as we always have done!! Please click on the links below to See the actual Early Day Motion (EDM395) & the ever vigilant Julian Cheyne's report on it for Games Monitor. Have you ever noticed just how dirty Leabank Square is? Grab yourself a cuppa, put a coat on - and take a short walk around the Square. There is so much litter, empty cans, plastic bags, dog poo, newspapers, even used nappies (!) lying around. I am positive that hardly any of this is the fault of the residents of Leabank Square - there is NO WAY that anyone would do this right outside their own doorstep deliberately! It is really down to the extremely bad management of the separate ares of Leabank Square. All the residential estates surrounding us are managed by one exclusive management company - and that means that the services are all done by one company. Leabank Square, however, is manged by 5 different management companies - all with their own separate agenda, timetable & set of standards. And this isn't even a large residential square!?! The most illogical aspect of all this - is that the separate management companies all come to maintain & clean up on different days. This means that when on block is cleaned - there is still rubbish & litter lying outside the others - which the wind blows back to the newly cleaned block!! Why can't we get all the separate blocks & terraces to be cleaned & maintained on the same day? That way - we will have at least 3 or 4 days a week - when Leabank Square looks beautiful! That way too - when every resident sees something lying around - we can simply pick it up and bin it. As you all know - the Community Association was re-launched last month - and we will be seeking a meeting with all the separate management companies together - to see if we can arrange this simultaneous weekly clean-up! We will also lay down minimum standards for the cleaning. This means that we need to say what it is exactly - that we want done in Leabank Square - on this common day. How often do we want all the bins in the blocks of flats disinfected? How often do we want sweeping of all the sidewalks done? How often do we want the windows cleaned in common stairwells & corridors in the flats? How often do we want the communal grass areas mowed? How often do we want the hedges along Berkshire Road trimmed? How often do we want all the litter picked up all around the square on the same day? British Waterways, working with the Environment Agency and the Olympic Delivery Authority, is undertaking a programme of dredging on the River Lee Navigation to help improve water quality, and access for barges in and around the Olympic Park. Local residents, boaters, businesses and clubs have all been made aware of the programme via letter and meetings. Please find attached a copy of the letter sent to local residents. If you require any further information please do let me know. Water quality on the River Lee Navigation has been an issue of concern for many years, affecting local residents, wildlife, boaters and other waterway users. Now a number of organisations are working together to improve the water quality of the river. This will be a long-term programme of works to help deliver a clean, green and active waterway. The first step in this clean-up programme is a c.£5million programme of dredging and bridge protection works. The Environment Agency is funding the removal of up to 16,000m3 of silt from the River Lee Navigation, from Tottenham Lock downstream to Old Ford Lock, whilst the Olympic Delivery Authority is funding the dredging works that will open up the waterways in and around the Olympic Park, first for freight barges, and in legacy for leisure use. 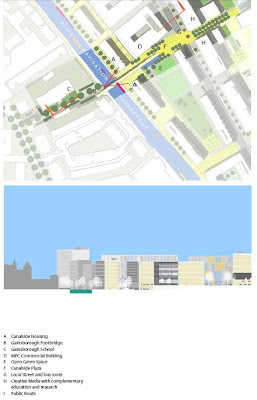 The works will take place between February and May 2009. The dredging barges will remove big obstructions first, such as car parts and trolleys that have been dumped in the waterway, before removing silt from the river bed. The dredging of the polluted sediments will gradually help improve the water quality of the river, which in turn will encourage wildlife to return to the area, enable boats to travel more easily along the river and improve the appearance and even the odour of the waterway. British Waterways will be managing the dredging programme, and is talking to hundreds of users and neighbours of the River Lee Navigation to ensure that people are made aware of the planned works and any minor disruption which may affect users. If you need any further information about the dredging programme please call British Waterways London T: 020 7985 7200. If you would like to report any dumping of rubbish or illegal fly-tipping along the River Lee Navigation please call the Environment Agency T: 0800 80 70 60. This magpie has been visiting our green often - and can often be heard - before seen! You have got to admit - it is a magnificent bird - and we are very lucky to have it!! Magpies seem to be jacks of all trades - scavengers, predators and pest-destroyers, their challenging, almost arrogant attitude has won them few friends. With its noisy chattering, black-and-white plumage and long tail, there is nothing else quite like the magpie in the UK. A massive thanks to all the great folk at Hackney Marsh Users Group - especially Steve - who is a fantastic friend of Leabank Square - for the heads-up on newly coppiced logs for our green!!! Everyone can see that the borders are looking a whole lot better around the green due to the logs which are keeping the soil from eroding out through the rails. The Hackney Marsh Users Group all volunteer to manage the woods, orchards & meadows all around Hackney Marshes. They can always do with new volunteers to help them out. On Sunday - they started a new dead-wood hedge alongside the embankment below the Eastway Motorway. As you can see in the pictures above - it is a magnificent hedge which will encourage greater biodiversity along a very busy highway. There is also a splendid example of a simple no-nails woodwork bench made out of the coppiced trees! These volunteers are highly experienced woodspeople - who love passing their skills & experience on to others. Please follow the links below to find out more about joining them as a volunteer. In the meantime - thanks a whole heap for our lovely logs!! How's this for a spot of great luck?! Elspeth has very kindly donated a fantastic brand new hoe to Leabank Square!! As you all know - most of our tools were nicked out of the cupboard by some rag & bone van a few weeks ago - an Elspeth brilliantly stepped up to the rescue with this magnificent hoe! Elspeth - thank you so very much for your kind donation - we will definitely put it to diligently hard work! Last night was the inaugural meeting of the Leabank Square Community Association!! As you all know - this has been a very long (& at times - withdrawn) process. We have had many previous attempts, false starts, different names, tenants groups, residents groups, consortium's - you name it - we've probably had it!! 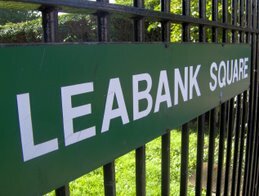 But this is it - Leabank Square - we finally have a Community Association! So....... What does that mean? Basically - it is a tiny group (at present) that will aim to represent everybody who lives here in Leabank Square - in our dealings with the different management companies, council officials, Olympic representatives, local organisations, etc. We only want the best for Leabank Square!! We want to have loads of diverse events, barbies, picnics, celebrations, parties & festivals. But we also want to improve our square by planting new & exiting gardens, making minor repairs to our facilities, creatively decorating dull corners, making the entrances of our houses more attractive & green, hiding the purely functional bin & recycling ares under beautiful & green structures, having annual Spring-Clean days, introducing communal dog-poo & litter bins, etc. Another very exciting opportunity springing out of having a Community Association - is the ability to raise funds exclusively for Leabank Square! We have opened a bank account for this purpose, which is strictly controlled by three signatories - who will be fully accountable to the rest of us for any expenditure by all of us. This means that we can write to organisations, companies & individuals and ask for funds for particular projects. The founding association comprises Tracie (Chair), Debbie (Secretary), Nadira (Treasurer), Sóna (Olympic Spokesperson), Simon (Board Member), Stewart (Board Member). As in any Association - these roles are held for a full year, and then voted on at an Annual General Meeting the following year. These are very exciting times for all of us here in Leabank Square!! The whole of Hackney Wick is going through an incredible period of fast change - and we need to have a Community Association set up in order to take advantages of this change!